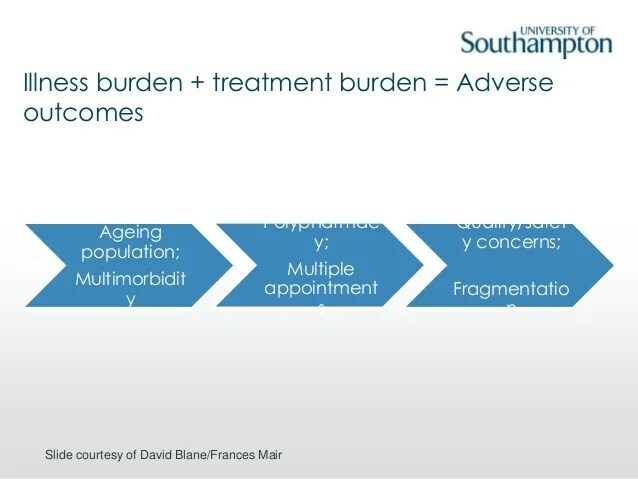 Frances Mair and I have an Editorial in this week’s British Medical Journal that sets out some of the key problems around Burden of Treatment and multi-morbidity. That the BMJ should commission this editorial from us shows that the idea of Burden of Treatment is getting traction across the healthcare economy. And why shouldn’t it? The bug issue here is patient and carer workload – something that we know much less about than we should. The editorial comes hot on the heels of an important meeting sponsored jointly by the National Institute of Health Research and the Royal College of General Practitioners that sought to develop a strong research agenda on multi-morbidity. The key message that I took away from that meeting was that there was a real risk of turning multi-morbidity into a kind of new disease in itself – in the way that we often now hear chronic illness and long-term conditions spoken about in a quite undifferentiated way. In fact, the big problems here are at a system level, and they’re the problems that Frances and I discuss in our editorial. I was a plenary speaker at the RCGP NIHR Multimorbidity meeting and I’ve embedded my powerpoint presentation below. The article is out! You can review it here. A man being treated for heart failure rejects the offer to attend a specialist clinic because in the previous two years he has made 54 visits to similar clinics for consultant appointments, diagnostic tests, and treatment. According to the authors of this analysis paper, this case and others highlight the need for minimally disruptive medicine that seeks to tailor treatment regimens to the realities of patients’ daily lives. We have an exciting group of researchers coming together to contribute the evidence base for minimally disruptive medicine. The kick-off publication will be coming out in the BMJ soon. The authors of that publication are Carl May, Frances Mair, and Victor Montori, and you can learn more about them and their work in their own websites by clicking on their names.